Impression Liu Sanjie - The musical on the water that brings an incredible tale about harmony and peace; it's shown with visual vividness and emotional brilliance entertaining but also enlightening millions around the world. I’m sure all of us remember the Beijing Olympic opening and closing ceremonies. The incredible tale about harmony and peace shown with such visual vividness and emotional brilliance was not only entertaining but also enlightening millions around the world. Well, not many however may remember that these spectacles were directed by the famous Chinese film director: Zhang Yimou. Fortunately for us some time ago this renowned film director began also directing stage productions. He co-directed series of outdoor musicals under the common title “Impression” and the first of them - “Impression, Liu Sanjie” found its home near Yangshuo on the waters of the Li River. 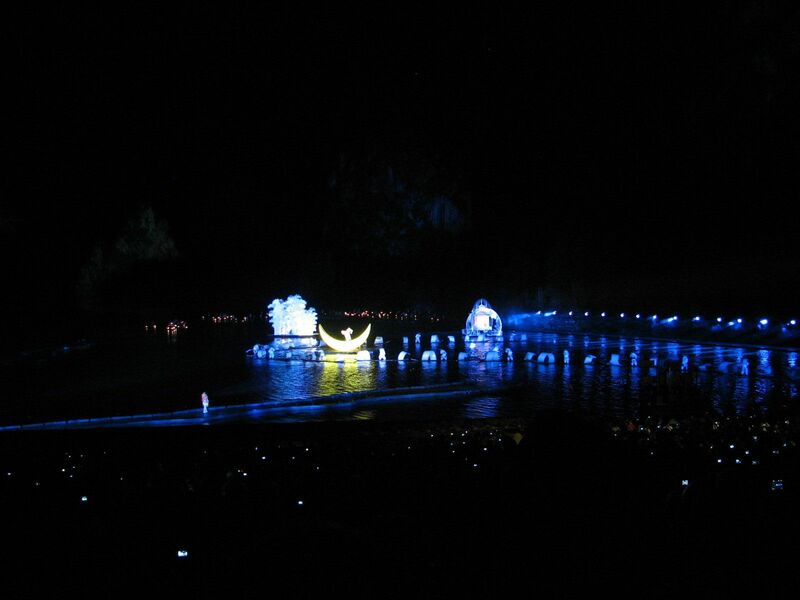 Impression - Liu Sanjie: The fairy-tale show of lights, sound and music on the waters of the Li River. Despite the fact that the riverbank stage boasts about two thousands seats, our guide had to use all her skills to find the tickets for the evening show. That gave us a sense of importance of being there although we still did not have any idea what was waiting for us. The stage itself – a natural setting of the Li River tributary waters with Shutong Hill limestone peaks in the background promised fabulous spectacle. And frankly, even today, almost two years later, I do not have words to describe my emotions. During one-hour show, more than six hundreds actors – local fishermen and members of vocal groups, dressed in different styles of Zhuang, Miao and Yao ethnic clothing were jointly performing and singing folk songs. To my surprise and delight – the musical notes and voices were so beautifully harmonious …. But the fantastic part of the show was due to the combined visual effects of hundreds of actors carrying lights, the light-flooded surroundings and natural scenery… All guided by the dazzling scenario and played together with virtuosic skills of sound and light technicians, decorators….. The fairy-tale show with the backdrop of natural scenery of light-flooded limestone peaks. Imagine for example moving chain of actors coming out of the night’s darkness (in other words from nowhere) and seemingly walking on the waters ….! Although usually one picture is worth more than thousand words, I realized that in this case of so complex “multidimensional” effects my pictures cannot fully reflect the enchanting beauty of the spectacle. 3rd from the left - imagine deep darkness than 1 actor carrying lights appears from nowhere, then the 2nd one and more and more follow in a chain seemingly "walking" on the water..
My final words – being in Guilin and not taking the Li River cruise is like “being in Rome and not seeing Pope”. However taking the cruise and not seeing the folk-musical “Impression, Liu Sanjie” in such breath-taking natural scenery is unforgiving. Believe me - you cannot move this kind of show to Broadway without taking out of it its soul, sparkling visual effects and mysticism of the place so please take my words – it is a "must" to see it there! I'm almost sure that after this presentation of Guilin, its parks, Li River cruise and the "Impression - Liu Sanjie" show you will be checking for China Tours. Impression - Liu Sanjie: Backdrop limestone peaks exposed by flood-lights as the backdrop of the folk-musical scenery. For those inspired by these pictures I wanted to mention that the overwhelming success of the “Impression, Liu Sanjie” show (from its beginning in 2003) convinced Zhang Yimou to continue the series of “all-in-nature” musicals. Consecutive openings of "Impression Lijiang" (inaugurated in June 2006 at the Jade Dragon Snow Mountain in Lijiang, Yunnan province); "Impression West Lake" (big opening in 2007 on the West Lake in Hangzhou, Zhejiang province); "Impression Hainan" (began late 2009 set in Hainan province) and "Impression Dahongpao" set on Mount Wuyi, Fujian province; (all five performances are co-directed by Wang Chaoge and Fan Yue). If you have a chance to see one of them, please share with us your "impressions". But that is not the end of Guilin tours. Before you switch to Expedia to buy an air ticket to China please stop to explore the amazing world of Guilin's caves. This will be the next trip to the fairy-tale kingdom - this time the underground one called "The Palace of Natural Arts" or Reed Flute Cave. And DO NOT miss opportunity to see Giant Pandas and their distinct cousins Red Pandas by clicking: Giant Pandas--- and follow several pages.